We are still working on the inventory but we are getting there! We appreciate your patience with us! Due to impending weather conditions, we are going to cancel our Sharynn’s Stitching Friends for Saturday, January, 13th. We don’t want anything to happen to our wonderful customers. So our February 10th date will be the first one. Our Embroidery Class will resume on February 14th. More information to come. OPPS!! We stated that the Charming Shop would be in March but the actual dates are April 4, 5, 6, & 7. It usually is the last week of March but due to Easter it was moved to April. The hours will be 9-6 Wednesday thru Friday and 9-5 on Saturday. Please mark your calendar. Do you own a Handi-Quilter? We are again going to do a ruler of the month club. If you are interested, please call the shop. 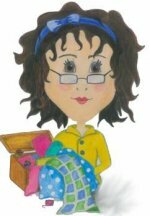 Sharynn’s Quilt Box is a Signature Dealer for ACCUQUILT GO! CUTTERS. The January Sales Event includes up to 40% off select GO! Dies (in stock only and limited quantities). Save $200.00 on the Ready. Set. GO! Ultimate Fabric Cutting System. This system is on sale for $349.99. If you purchased these separately you could spend up to $557.89!! This is a great system and an awesome price. So come in and get a demo of how this works. You can cut up to 6 layers of cotton and 2 of flannel. Your quilt pieces are accurate and “clean”. No chance to cut your fingers like with a rotary cutter! The GO! Baby is on sale too and you can save $30.00. We will have SIT ‘n’ SEW on January 31st here in our shop from 1 to 4 p.m. This is free to you to come and sew on your projects. We love having you!! The Handi-Quilter class that was scheduled for April has been cancelled due to a conflict with the Charming Shop Hop. We will reschedule. Watch the newsletter for more information.